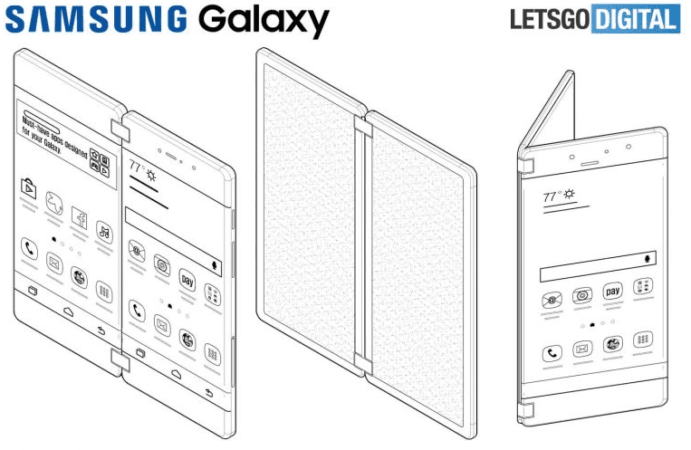 Rumors about a foldable Samsung smartphone have been circulating on the Internet for years. Samsung executives, including the mobile business head DJ Koh, have indicated that the much-hyped foldable phone would debut in early 2019. It’s no secret that the device, dubbed Galaxy X for now, would sport a foldable screen. But there will be much more to the Galaxy X than just a foldable design. A recent patent granted to Samsung suggests that the Galaxy X screen could also have self-healing properties. The Korean electronics behemoth has filed multiple patents related to the foldable Galaxy X screen. It has been exploring a variety of design options for how users will interact with it and how it would fold. Just a few days ago, the World Intellectual Property Organization (WIPO) granted a patent to Samsung that describes a protective layer on top of the screen to remove the scratches and fingerprint smudges. The material also has excellent flexibility, which means it could even “be applied to a flexible device and the like,” says Samsung. The keyword here is “flexible device.” The Galaxy X will have a foldable design, and it needs a flexible display to make things work. Repeated folding and unfolding could damage the Galaxy X screen. And that’s where the self-healing material could prove useful. It will automatically repair the scratches. The patent titled “Anti-fingerprint composition with self-healing property, film, laminate and device” describes one of the biggest pain points of users – scratches and fingerprint smudges. According to the patent document, the self-healing material will be made out of “polyrotaxane, polyhedral silsesquioxane, and fluorinated (meth) acryl.” Though Samsung is more likely to use it on the foldable Galaxy X screen, we wouldn’t be surprised to see it on the next year’s Galaxy S10 as well. The accidental damages to screens cost users hundreds of dollars, and Samsung would want to minimize such incidents. In the past, LG Electronics had used a self-healing material on the LG Flex 2, but it was limited to the phone’s body, not the screen. If Samsung uses the newly patented material in the Galaxy X screen, it could eliminate the need for a screen protector. The Korean company could also sell it to other vendors in the future. The Galaxy X will reportedly have a display that folds like a wallet. The two halves of the display will face each other when folded, and would measure up to 7 inches diagonally when unfolded. Samsung would also add a small external display to give users a quick glance at notifications, time, battery percentage, etc. without having to unfold the device frequently. It would have a 21:9 aspect ratio and 3360 x 1440 resolution. The self-healing material would solve only one issue affecting the Galaxy X. Since the phone will bend like a wallet, the company has to ensure that the internal components including the battery are durable enough to withstand repeated folding and unfolding through the life of the phone. Samsung will also have to customize the Android OS heavily because the foldable device would require an entirely new user interface. Samsung SDI has successfully developed a flexible battery that can pack 3,000mAh to 6,000mAh power. The Korean company could use the flexible battery in its foldable smartphone. The 7-inch Galaxy X screen would consume a lot of battery power. The Korean media has reported that the Galaxy X OLED display would enter trial production later this summer. Mass production is set to begin towards the end of this year. Samsung will produce the Galaxy X only in limited quantities initially to gauge consumer response. Due to its complex design and expensive display panels, the phone will be pretty expensive. The Wall Street Journal has learned from supply chain sources that it would cost more than $1,500. Golden Bridge Investment analyst Kim Jang-yeol predicts it would cost two million won (around $1850) in South Korea. Given its price tag, Samsung would target the device at niche audiences such as mobile gamers, at least initially. Chinese tipster @MMDDJ_ claims it might not be called ‘Galaxy X’ at all, even though the rumor mill has been using that moniker for years. Supply chain reports suggest Samsung could name it Galaxy F (foldable) instead of Galaxy X. Another Twitter tipster Ice Universe reports Samsung would unveil its foldable phone at the Consumer Electronics Show (CES) in January next year.